A horizontal incision (cut) is made in the crease just under the skin (where it is well concealed). A crescent-shaped, area of skin, based on the horizontal incision, with its widest part pointing backwards down the neck, is then removed, together with all underlying fat, extending under the skin down the upper part of the front of the neck to remove further fat. This is more thorough than liposuction (which can be appropriate on its own in some cases) and allows access to small strap muscles under the chin which are tightened with slowly dissolving stitches to improve the contour and tone in the area. The skin is then repaired with dissolvable stitches deep to the surface and fine nylon stitches to the skin itself, sticky tapes being applied over the operated area to help control swelling. At home, it is necessary to take life more gently and not to bend over too much to avoid bleeding. 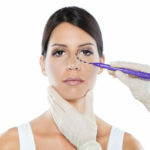 The stitches are removed at 7 to 10 days, leaving a scar in the crease line under the chin which takes 9 to 12 months to fade fully but which will take make-up soon after stitch removal. Some swelling under the chin continues to take up subtly over several weeks.